Board chair Patrick Halladay and outgoing superintendent Jeanne Collins at a recent school board meeting. In the off chance you haven’t seen the hundreds of red "Vote Yes" signs (plus some blue ones, concentrated in the New North End, urging the opposite), here’s a heads up: The Burlington school budget is up for a second and final vote today. This time around the total price tag is $67.4 million, which comes with a 7.2 percent tax increase. If residents reject it again, a default budget of $66.3 million will take effect, with a 5 percent increase in the tax rate. Polls opened at 7:00 A.M. and will close at 7:00 P.M. A list of polling sites can be found here. 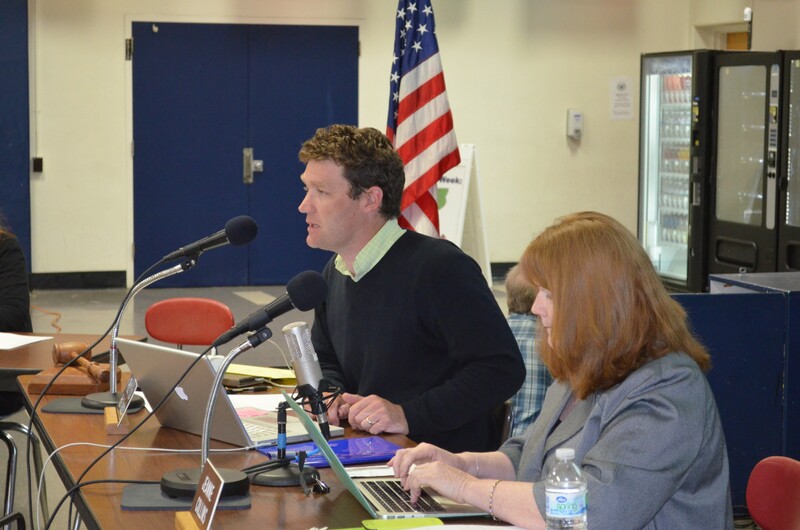 —Six new school board members were voted onto the 14-member board. —It was announced that there’d be a deficit of roughly $2.5 million for the current year and that one of a similar magnitude had been “built into” the struck-down Fiscal Year 2015 budget. —The Internal Revenue Service informed the city that it plans seek possibly $500,000 from the district for improper payment of payroll taxes. —Two veteran board members announced their resignations, effective June 30. —The superintendent, Jeanne Collins, agreed to step down and subsequently landed the same position at Rutland Northeast Supervisory Union. —The district’s finance director announced his resignation. School board members say they’ve fixed a fundamental error in the budgeting process so that the 2015 budget no longer puts the district on pace for another deficit, and they are tightening up their oversight of the district’s finances. Although the new 2015 budget proposal is bigger than the previous one, it includes a net $1.2 million of cuts. Board members say those reductions were necessary to correct the faulty calculations in the original budget, but they tried to steer clear of cuts that directly affect the classroom. The tax rate is lower because the statewide tax rate was set at a rate below what was initially estimated.